Connect with Joe Wiessner Realty to get the very best representation when it comes to Ocean City NJ Real Estate. Avoid the real estate sharks! Whether you're Buying or Selling in Ocean City, you owe it to yourself to get objective and unbiased representation. We will provide just that to you at Joe Wiessner Realty (fiduciary integrity, reasonable care, undivided loyalty, confidentiality and full disclosure). The perception is out there that there's hundreds and hundreds of licensed agents on the island, and there is. The truth is that 20% of the agents sell 80% of the real estate. Such an amount of concentrated power among so few may generally not benefit the consumer. That's why a fresh, completely objective perspective is important to you in order to obtain all important information enabling good decisions to get you the best possible results. Click the links below to see all the Ocean City Neighborhood Active Listings in real time. Lets Explore! The Riviera in Ocean City is a collection of truly amazing Bayfront homes, some on canals, some on the open bay. The Riviera ia a favorite of experienced boaters, especially yachtsman. Located with panoramic views of the Causeway Bridge and almost at sea level, the Riviera has the highest ground elevations — giving property owners the edge in inclement weather. All single family homes here, no condos or multi-family. The Riviera runs along the bay from 16th Street to 23rd Street. To add more action, the Riviera is located just to the north of the Ocean City Airport. Mostly short-hop single prop cubs, sleek dual-prop planes, along with frequent Coast Guard chopper landings. And for good measure, the Ocean City Municipal Golf Course is only a sand wedge away from the Riviera. The Gardens in Ocean City are a collection of some of the most eclectic properties on the island. A hallmark of The Gardens typically have larger lots and historic estates. Some feature epic ocean and bay views which beautifully frame the Longprt and Atlantic City skylines. The streets are curvaceous (first timers will get lost!) they wind through the manicured landscapes and weathered gray cedar shakes mansions. A favorite of the locals, real estate here is some of the most sought and prestigious in Ocean City. The Gardens Parkway is a gorgeous gateway to the Ocean City-Longport Bridge. Its lined with lush red crepe myrtles, convenient bike lanes, and private side-street capillary byways. The Ocean City North End Homes and Condos can offer many opportunities to break into the Ocean City market. Prices begin in the 300’s and ascend all the way to the high end. The North End runs from The Gardens at North Street to about where Ocean City High School is situated (to 6th Street). A wide variety of condos, single family homes, year round residents, and weekly multi-family rentals. Ocean City Central is an eclectic mix of beach, bustling boardwalk, Downtown Asbury Ave Shops, 9th Street Gateway Entry, Churches, Residental Neighborhoods, Summer Rentals, beach-block Motels, High-rise condos, and the Ocean City High School. Ocean City Central runs from approximately from the Atlantic Ocean, to 6th Street, to Bay Ave, to 18th Street. There is never a dull moment in Ocean City Central. Everything is within walking distance, plenty of shopping, restuarants, and board-walk energy. Ocean City 18th Street to 34th Street. Many varieties of real estate with a dizzying array of prices. This area runs from the beach block of Wesley Ave and Central Ave to 18th Street, to Bay Ave, to 34th Street. The majority of Ocean City real estate here are duplex condos. Many are one atop the others, some side by side. There are pockets of single family homes only as well. The spirit and community pride of Ocean City are on full display. Property values of very high in the beach block areas and level off a bit as we travel towards the middle Streets of Asbury and West Ave. The Ocean City Community Center and Golf Course are to the Bay side all both excellent community amenities. Numerous play grounds with tennis, pickleball, and basketball courts. Also the fantastic Howard Stainton Bird Sanctuary is in close proximity just off of Bay Ave opposite the Ocean City Airport. The Bay Landings area of Ocean City have Homes and Condos that are located adjacent to Ocean City Airport which runs along the bayside from 27th Street to about 33rd street. The majority of the homes are zoned single family. This allows for larger than average lots and more privacy. The curvy streets create an unusual, but aesthetically pleasing property sight-lines. Many locals reside here — along with second home owners. These homes are favorite among pilots, as a matter of fact, there are several homes where you can pull your plane into your private hanger, attached to your home! Attractive and somewhat more affordable, the Bay Landings are always popular in Ocean City. Merion Park Homes are on the Bay Side (some bay views) tucked between Roosevelt Blvd, unbuildable marsh lands, and a convenient shopping district. The real estate spans from about 34th Street southward to about 38th Street. These properties are away from the hustle and bustle of the “Boards” — not as many summer rentals in this zone, most are primary residences for the locals. Merion Park Homes are somewhat more affordable compared similar square foot values in Ocean City. The Ocean City South End begins just south of the Gold Coast at about 35th Street and continues to Ocean City's southern most, 59th Street. There's more year round residents than renters in this zone. Generally, the South End properties are a much shorter walk to the beach as compared to other Ocean City neighborhoods. The South End pace slows a bit making this area a favorite for beach-goers who like a more intimate setting. The Southend is the gateway via the incredible Ocean Drive to other Cape May shore resorts. The Corson's Inlet State Park is contiguous to the Southend. The park offers outstanding scenic beauty and endless opportunities for observing a multitude of migratory and wildlife species. Corson’s Inlet is extremely popular for hiking, fishing, crabbing, boating and sunbathing (drive your vehicle on the beach!). There's a wide diversity of construction style here. Ocean City South End Homes and Condos (mostly Duplex Condos) have a wide range in price ($300,000 to 1-2 million) depending on location and condition. 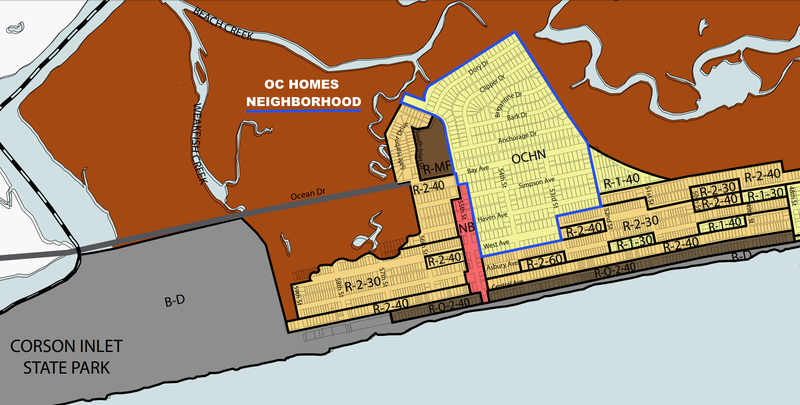 Ocean City OC Homes and OC Condos are the southernmost neighborhood in Ocean City. Beginning at or about 52nd Street and ranging to 55th Street and not far from the incredibly scenic Ocean Dive that leads to shore points south. Mostly single family homes with a cape cod design style. Some of the most affordable island real estate which makes it extremely desirable due to its closeness to the beach. This close-knit neighborhood provides a good entry level price point for Ocean City. Ocean City NJ Major. See every Ocean City Home and Condo for sale. Bayfront Homes and Condos are high end but a bit more laid back. Watch the tide rise and fall all day long. Bay water laps against the narrow-creeky docks that secure an assortment of watercraft. Ocean City is truly a boaters delight. Sit back and enjoy all of natures abundance, the crabs, the gulls, the breeze, and awe inspiring sunsets.